Now that our basement is finally fixed, we’ve set to work organizing the house the way we’d like it. We’ve sort of lived with everything where it fit in the year and a half since the disaster. We tackled the bedroom first. 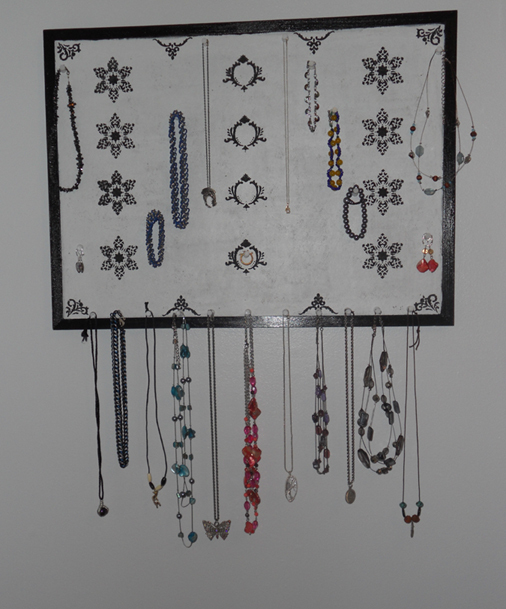 One of the problems I wanted to solve was jewelry storage. 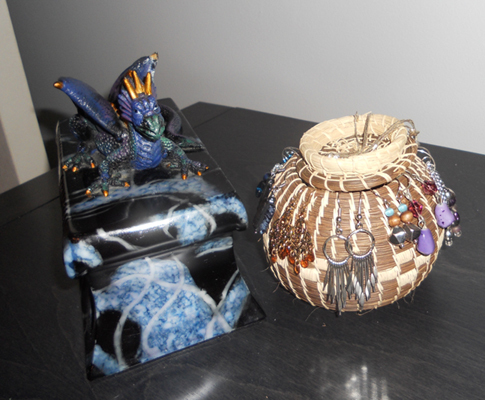 I have two jewelry boxes; a lovely wooden box with a unicorn painted on top and a resin box with a dragon statue that sits on top. I don’t want to get rid of either, of course, but unfortunately they’re just boxes. They don’t have compartments or hooks and my jewelry ends up tangled in knots while it’s stored in heaps inside. This leads to at least half an hour of untangling every time I want to wear something, which is less than ideal. I took to pinterest for a solution since I didn’t want to pay upwards of $75 for a new jewelry organizer. 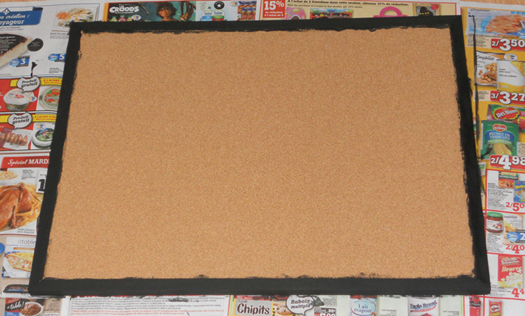 I found a lot of interesting solutions but the most appealing involved painting cork board. I found this option most appealing because we already had several cork boards for which we had no use. I sorted through them to find the best one and got to work. I started with a regular framed cork board of the sort used for office message/pin boards (in fact we’re using two others for that exact purpose). I’m not sure if it’s relevant, but I also chose a board with an un-glossed frame (I may have had to sand the frame otherwise, but I’m not sure). The first step was simply to paint the frame. I painted it black so it would look like most of the picture frames we use in that room (also all black). I used regular acrylic craft paint. I decided to finish off the frame with a coating of modpodge because I wanted it to shine a bit. 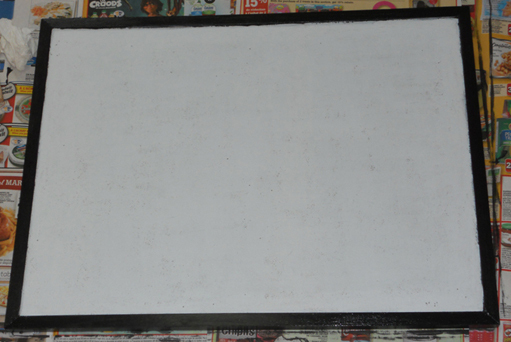 I’d also already decided to paint the cork board and I wanted a glossy surface that would be easy to wipe clean should I mess up on the next step (which turned out to be helpful more than once). Unfortunately you can’t really tell the difference in the pictures. With the frame finished, I turned to the inside. I could have done a straight stencil, but I was afraid it would get lost against the background and the jewelry even if I used black paint. After some discussion with my husband, we decided the best way to make it pop without making it too obvious was to use the same color paint as the wall. 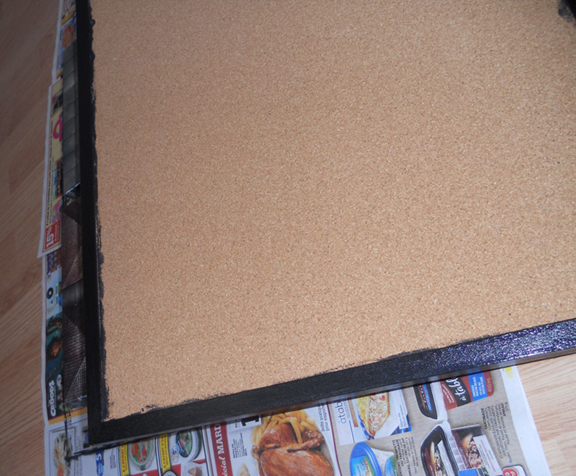 So I used the left over paint and covered the entire cork board. This is harder than it sounds. It was hard to get enough paint on the board since I didn’t want to use too much (I worried the latex paint would start to crack when pins were pushed into the surface if I painted too heavily in one place). I also didn’t want to paint so much that it would become difficult to use pins. But my first coat looked… well, painted. It was too rough and the brush strokes were too obvious, even from a distance. I decided on a second coat. The first time I used mostly vertical strokes to cover the cork and the second time I used mostly horizontal strokes in hopes I would get a more even spread. The result did look a bit cross-hatchy up close, but looks decently smooth from a distance. The last step was stencil. You could leave the cork a solid color if you wanted to, but I felt my jewelry would be a little too much on display in that case. 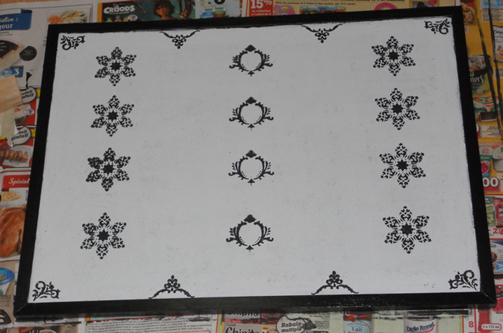 I found a set of cheap Martha Stewart adhesive stencils at Wal*Mart and used a variety of them to make an interesting pattern. And voila! Cheap and interesting display piece. People have told me from pictures it looks like fabric, which pleases me because it makes me feel I did well with the pattern. The latex paint works perfectly as well, it didn’t crack or interfere with the pins. You may be wondering why there aren’t more earrings. It’s because I picked up this beautiful wicker basket in Belize and decided to use it as part of the display. Overall, I’m pretty satisfied with how it all came out.